In the first two parts of this series we chronicled the importance of the Law of the Lord (Section 42), the fact that his people stumble when they don’t live it, and how the current shepherds over the flock don’t follow the scriptures in leading the people as they are required to by the Law. Perhaps the last phrase “preserved in safety” refers to the fact that Emma was entrusted with the manuscript after Joseph’s death instead of Brigham Young given the fact that Brigham oversaw changes to LDS history that cast a more favorable light on himself and his doctrines. Who knows what he would have done with the Inspired Version had he been given the opportunity. 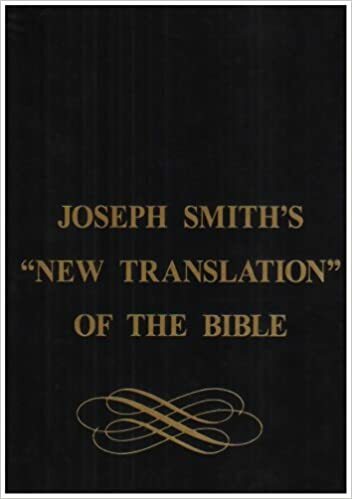 What I find interesting is that in the very next verse the Lord commands Joseph not to teach from what is revealed in the IV until it has been received in full. The fact that he didn’t preach from the IV suggests there is more yet to come. Today, we have the Inspired Version which has been published by the Community of Christ (previously known as the Reorganized Church of Jesus Christ of Latter-Day Saints). I highly recommend that any serious student of the scriptures pick up a copy which can be obtained HERE. An online copy is also available HERE. The foregoing is an amazing prescient warning. When I look at the inspired changes made by Joseph, I realize just how far afield we currently find ourselves on so many issues and doctrines. So let’s now explore some of what I consider to be the most important changes that he made in the Inspired Version. This blogpost is meant to be a big-picture overview, so I will not spend much time expounded on each of these, but they could each easily be expanded and analyzed in depth. All Things are delivered to me of my Father; and no man knoweth that the Son is the Father, and the Father is the Son, but him to whom the Son will reveal it. All Things are delivered to me of my Father: and no man knoweth who the Son is, but the Father; and who the Father is, but the Son, and he is whom the Son will reveal him. The unity and oneness of the Son and the Father are clearly declared, giving us additional information on the “Mystery of Godliness.” (See also, JST 1 Timothy 3:16). And then will I say, Ye never knew me; depart from me ye that work iniquity. See my series on what it means to “Know the Lord” Part 1, Part 2, and Part 3 which include other scriptures on this point. Also, JST Matt. 25:11. For I will send my servant unto you who are blind; yea, a messenger to open the eyes of the blind, and unstop the ears of the deaf; And they shall be made perfect notwithstanding their blindness, if they will hearken unto the messenger, the Lord’s servant. Thou art a people, seeing many things, but thou observest not: opening the ears to hear, but thou hearest not. The Lord is not well pleased with such a people, but for his righteousness’ sake he will magnify the law and make it honorable. Who is blind, but my servant? or deaf, as my messenger that I sent? who is blind as he that is perfect, and blind as the Lord’s servant. Seeing many things, but thou observest not; opening the ears, but he heareth not. The Lord is well pleased for his righteousness’ sake; he will magnify the law and make it honorable. The Inspired Version makes this so clear that the Lord is speaking to a people who must give heed to a servant He will send to take away their blindness. Isaiah is observing us in the last days thinking that we see the truth when, in fact, we don’t. See my series on our modern day blindness and deafness HERE. This entire chapter has been re-written by Joseph to clearly teach that true prophets can lose their prophetic gifts when the people are unrighteous and reject their God. I highly recommend reading the entire chapter. Additionally, v.26 clarifies that the people who “draw near to him with their lips, but have removed their hearts far from him” are the one’s who have been delivered the Book of Mormon. Very sobering! See also 2 Nephi 27. A choice seer will I raise up out of the fruit of thy loins… and he shall be great like unto [Moses]…And out of weakness shall he be made strong…for the thing which the Lord shall bring forth by his hand shall bring my people unto salvation. This prophecy is also found in the Book of Mormon. Very revealing about the role of Joseph Smith in the salvation of the Lord’s people in the last days. Also, allusions to a future work to be accomplished in convincing the people of the truthfulness of the Lord’s word and confounding false doctrines. It being after the order of the Son of God; which order came, not by man, nor the will of man; neither by father nor mother; neither by beginning of days nor end of years; but of God; And it was delivered unto men by the calling of his own voice, according to his own will, unto as many as believed on his name. The scripture goes on to describe the great power held by those of the Melchizedek order. I have written extensively in a post entitled “I am not a High Priest“about the fact that we do not understand what it really means to be a high priest as experienced by Joseph and 22 others at the Morley farm in June 1831. To be a high priest one must be called by God himself, and then ultimately chosen if they prove faithful. One does not become a high priest with the passage of time or because one is called into a bishopric or any number of other callings in the church that are reserved for high priests. God himself must call you by his own voice, it is not by the “will of man” nor by lineage. [Melchizedek] lifted up his voice, and he blessed Abram, being the high priest, and the keeper of the storehouse of God; Him whom God had appointed to receive tithes for the poor. Wherefore, Abram paid unto him tithes of all that he had, of all the riches which he possessed, which God had given him more than that which he had need. The great high priest, Melchizedek, was the keeper of the Lord’s storehouse. We learn that the storehouse is for the POOR, not to build spacious buildings and make investments. “Bring ye all the tithes into the storehouse” (Malachi 3:10) takes on the meaning that contributions are to be used primarily for the poor. Additionally, tithing is to be made on one’s surplus – more than that which we have need – not on gross earnings. That is God’s eternal law. For, behold, he cometh in the first watch of the night, and he shall also come in the second watch, and again he shall come in the third watch…blessed are those servants when he cometh, that he shall find so doing;…I say these things unto you, that ye may know this, that the coming of the Lord is as a thief in the night…I speak unto those whom the Lord shall make rulers over his household, to give his children their portion of meat in due season. And they said, who then is that faithful and wise servant? And the Lord said unto them, It is that servant who watcheth, to impart his portion of meat in due season. Joseph’s version brings much greater clarity that the Lord will visit the earth 3 times before he comes in his glory. He comes as a thief in the night and all must be watching and waiting for His coming. Also, he is directing his words to the shepherds of His people informing them that they must be prepared to teach and administer the law of consecration which is what I interpret “to give his children their portion of meat in due season” means. The wise servant is the one who watches for the Lord and is prepared to live the law of consecration when the time comes. The blogger that goes by “Watcher” has taken this cyber moniker, I believe, because of the importance of this doctrine to us in the latter-days. We all must catch the spirit of watching and waiting for the Lord. 9 – King David sinned in taking many wives and concubines. Note that the Lord is talking to Solomon in these verses. And if thou wilt walk in my ways to keep my statutes, and my commandments, then I will lengthen thy days, and thou shalt not walk in unrighteousness, as did thy father David. See also and compare chapter 11 of 1 Kings. Joseph made consistent edits that David sinned (although he did ultimately repent except for the case of Uriah) whereas the KJV says that David walked after the commandments of the Lord. These changes seriously challenge the polygamy narrative of the church and Section 132. John 1:21-22 And he confessed, and denied not that he was Elias: but confessed saying; I am not the Christ. And they asked him, saying; How then art thou Elias? and he said, I am not that Elias who was to restore all things. John 1:21-22 And he confessed, and denied not; but confessed, I am not the Christ. And they asked him, What then? Art thou Elias; And he saith, I am not. Note that “Elias” is the Greek translation of “Elijah”. This doctrine is too fantastic for most people to believe and yet it has multiple witnesses in the scriptures and fully explains how Joseph and Oliver had the priesthood “revealed” to them when John the Baptist (Elijah) visited them in May 1829. See D&C 2:1. This amazing reveal is discussed further in a previous blogpost you can access HERE. Therefore, let every man stand or fall, by himself, and not for another; or not trusting another. Seek unto my Father, and it shall be done in that very moment what ye shall ask, if ye ask in faith, believing that ye shall receive. And if thine eye which seeth for thee, him that is appointed to watch over thee to show thee light, become a transgressor and offend thee, pluck him out. This is strong medicine for people who believe that if they just follow the “prophets” they will be fine. We must all be prepared to stand on the sure foundation of Christ and his Holy Word, and not place our salvation in the hands of another. “Pluck out” seems to suggest to me that we not sustain those who are failing to lead us towards the light of the Lord’s law. This was a recent discovery for me. I am blown away by how clearly it describes our day when we claim to be God’s chosen church and people and yet we have all gone astray after false doctrines, including the masonic temple ordinances, celestial polygamy, etc. We don’t follow the Law of the Lord, nor do we understand the true nature of God. We are without knowledge and the poor among us are trodden down by the priests who extract tribute in order to enter the temple and bring not the tithes into the storehouse. Verse 6 says they are “ashamed of the counsel of the poor”. The foregoing is just a smattering of some of the more salient doctrines that were clarified by Joseph. We rarely preach from the Inspired Version and hardly ever explore the doctrines that in any way conflict with modern interpretations out of HQ. Instead we would rather hear insipid pep talks on keeping the commandments and doing missionary work. Woe unto you, lawyers! For ye have taken away the key of knowledge, the fulness of the scriptures; ye enter not in yourselves into the kingdom; and those who were entering in, ye hindered. Putting this together has been an amazing spiritual experience for me as I continue to search the scriptures and gain knowledge. My commentary is not to be taken with any authority. Rely only on the scriptures and the Holy Spirit. I want to thank you for your posts. I ordered a J.S. Inspired version of the scriptures and it has made a lot of difference in my scripture study. I have a set that is older, from the RLDS church times. It’s so nice to just read it and not have to look for footnotes, or read it the wrong way, then try to plug in the JST footnotes. I like how you pointed out that the translation stayed safe with Emma. I believe Brigham Young WOULD have changed it to support his way of doing business! I do wonder this, why didn’t Joseph Smith, when he was doing the inspired version, make some of the gospels match up, like in the calling of Christ’s disciples, and there are some differences I noticed after he was resurrected. Is it because those parts don’t matter so much? What a great collection of JST passages. Perhaps there is no need for me to continue doing my series on the topic.. I had never noticed the Psalms 14 changes thank you for bringing that to my attention. 6 And the anger of God kindleth against the inhabitants of the earth; and none doeth good, for all have gone out of the way. 4 And my vineyard has become corrupted every whit; and there is none which doeth good save it be a few; and they err in many instances because of priestcrafts, all having corrupt minds. An additional interpretation for your last thought about losing the fulness of the scriptures relates to the practice of proof-texting specific verses to reinforce existing beliefs, rather than searching the scriptures to have the truth unfold to our understanding. Lawyers weren’t the ones who kept the JST from publication, but there are many lawyers making decisions on church policy and teachings today. I am thinking in particular about the recent changes to the youth curriculum, including seminary, institute, sunday school, and priesthood/young women. I am afraid that the current approach to teaching the standard works will leave young people with NO desire to search the scriptures because every time they are taught from them, they hear the same thing. Who’s Afraid of Section 77?